As we want you to love our clothes our guarantee is simple. If you are not completely satisfied with any of our products, we will be happy to either exchange the item or credit your original method of payment, excluding delivery charges. Contact us either by 08 8382 5803 or by email admin@ljb.com.au. We will email you a returns form or you can download our here Ljb Maternity’s Returns Form . *Fill in the details provided and include it with the receipt that you receive with your parcel and indicate the reason for return. *Goods must be returned within 7 days of receipt date in their original packaging and condition with tags attached, UNWORN and UNWASHED. *We reserve the right to refuse a refund if goods have any marks/stains, perfume smells or looks worn in anyway. If goods are return in this condition a refund will be denied and posted back to you. *All customers are responsible for the postage cost of returning unsuitable items to us. *We are not responsible for any merchandise damaged or lost en route to Ljb Maternity. So please send your package via an insured and traceable method to ensure a safe and documented delivery.We recommend using Australia Post Express Bags. 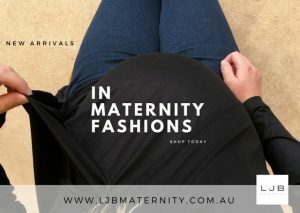 *No refund will be issue if goods are not return to Ljb Maternity. *We also reserve the right to refuse a refund. If you need to exchange an item for a different size, colour or item, please contact us via email admin@ljb.com.au or phone us at 08 8382 5803 advising which item you wish to exchange. *The item(s) that you have purchase will need to be return to us in the original packaging and conditions with tags attached. *We are not responsible for any merchandise damaged or lost en route to Ljb Maternity. Please send your package via an insured and traceable method to ensure a safe and documented delivery. We recommend using Australia Post Express Bags. *Once we have received your original item your exchange item will then be despatched. *All Australian orders will be posted free of charge. Please allow 5-7 days business days for processing of an exchange item. Faulty items must be reported within 7 days of the invoice date.Contact us either by 08 8382 5803 or by email admin@ljb.com.au. We will email you a faulty Garment form that needs to be return with your garment. *After inspection of the garment and if a fault is determined then either an exchange will be given or a refund of your original payment method or a store credit. *If garments have been worn/used or washed that are faulty. We must be notified. Items that are damaged as a result of repeated wear and tear are not deemed to be faulty. We will then reserve the right to refuse a refund.